The simple answer is high-quality content serves both audience and business. “It’s written in such an energetic and engaging way that it will trigger the audience to take actions,” says Massimo Chieruzzi, CEO of AdEspresso. Nathan Ellering, head of demand generation at CoSchedule, says high-quality content is synonymous with highest-performing content. At his firm, that content includes five distinct characteristics: great topic, well-researched, optimized for search engines, comprehensive plus actionable, and optimized to capture leads. Quality content is “powerful enough to stop people in their tracks, make them think, and debate with themselves or others. It is user-centric, capable of solving a user’s most painful challenges,” according to Hotjar’s Louis Grenier and Fio Dossetto. 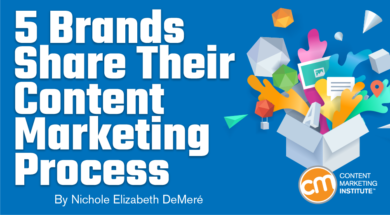 Content marketing strategists from these three brands plus two more willingly shared how they ideate, strategize, and produce that high-quality content, and evaluate its success. Read on to get some tips and insight that you can incorporate into your content marketing process. We have internal and external copywriters based on the topic. Data-driven articles usually are written in-house. We typically pay above market rates to secure the best writers and avoid high turnover. Every six months we review our buyer personas. We analyze the ROI of each one. We fine-tune them and sometimes add new ones or remove some. It helps us understand the needs of our customers and the problems they’re trying to solve with our product. Each month we try to have a good editorial balance and have new content published for each buyer persona. We try to listen to every signal regarding interesting topics we might cover in our blog: Twitter, Facebook, Quora, emails and, most of all, our customer support, which is usually the source with the better pulse on the situation when it comes to what users are looking for. Once we define a topic, we write down a couple potential titles that might appeal to our users and are friendly for social sharing. We trained our editorial team to do basic SEO analysis using Moz and SEMrush to analyze the potential search volumes of the keywords targeted in the new piece of content. Not every blog post needs to be a SEO hit but most of our traffic comes from Google, so we care about optimizing our content. That said, we’ll still cover a hot topic that can generate a big spike of traffic in the first few weeks mainly from social sharing. We also compare search volume to purchase intent. For generic keywords, we need a high volume to justify writing the post. But for keywords that show high purchase intent, lower search volumes are fine because conversions could be higher with those posts than with the generic articles. As part of this step, we also analyze if our existing content ranks for the keywords we want to target. If we do, we refresh that content rather than create something new. To make every content piece unique, we run each blog post through our data-engineering team to see if it can extract meaningful data from our database to enrich the blog post and validate what’s written with real-world data. Because we write about topics such as advertising in social media, our data from $30 million in monthly spending for Facebook ads gives us a huge advantage in using original data to produce useful content. Once the content is finished, our editor-in-chief does a first review and works with the writer to have the post 100% aligned with our brand identity. Before the content is published, we usually run a final SEO check to fine-tune the title, URL, and section titles. This process takes less than an hour and guarantees nothing has been overlooked. Our content, from creating to editing, from SEO to graphics, is produced in-house mostly by a team of two. Editor Ash Read plans the content strategy and edits the content, while I write most of it. On a high level, we figure out what our audience wants to read by studying our blog post data and sending surveys to our subscribers. We find our audience prefers our long-form, educational blog posts around social media marketing. My process is straightforward (but not necessarily easy). I do thorough research, deciding what to include and what not to, and distilling the ideas into an easy-to-understand article. As for content distribution, it’s something we’re still learning. SEO (using Google to help distribute our content), partnerships, and social media have worked recently. We track and measure each post’s performance. Engagement metrics like traffic and time on page speak to the quality of the content. We also care about the number of sign-ups and customers who subscribed from the blog. To track these, we use a combination of Google Analytics and Looker (with the help of our data team). This information helps us generate new content ideas, and the cycle repeats. While we accept some guest content, our five-person demand-generation team creates the majority of our content. The team focuses on publishing content to attract an audience similar to our best customers. We measure every piece against the type of leads it attracts, then use that knowledge to develop new content ideas. For example, we discovered a blog post targeting the keyword “marketing plan samples” provides a high number of marketing-qualified leads. So, we published another blog post targeting the keyword “marketing plan outline” to attract a similar audience. We also generate new ideas based on successful content’s structure, angles, and research. For example, a blog post about the best times to post on social media was so successful at generating marketing-qualified leads that we used the same structure for a post about the best times to send email. While we review many key performance indicators (like page views with Google Analytics), our number one goal is to generate marketing-qualified leads. We use Kissmetrics to understand the output of every piece we publish. We give every piece a 30 days period after it publishes to generate results. Then we compare the pieces to one another to dissect trends from our best- and worst-performing content. Ideas come from our entrepreneurial journey, lessons we’ve learned, and topics we feel strongly about as a team. Other content is user-led and based on surveys and interviews of customer segments. We want to understand the biggest challenges users face in their day-to-day work and career progression, so we can create content that truly helps. 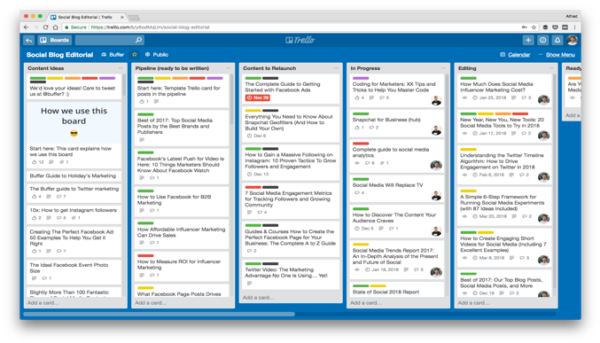 Then we collect our content ideas in a regularly updated editorial road map on Trello. The creation process involves individual and collaborative phases depending on the final piece. For written articles, the research phase informs the outline and first draft, which is then reviewed by internal proofreaders before a second draft is created. For video and audio content, the preparation process is similar, but it also involves external people (e.g., interview guests, videographers). When we release new content, we post it on Facebook, Twitter, and LinkedIn, and send an email alert to subscribers. For more complex projects, we work on outreach in advance by involving people who could help promote it in the creation process. For example, we invited a few industry people to review the first draft of The Essential Guide to Growing Your Early-Stage Saas Startup. We opened the second draft to over 400 beta readers for feedback. By making readers part of the creation process, we want them to have co-ownership of the project and help us spread the word. Doing manual outreach takes a lot of time, but it helps us create organic traction that keeps people coming back. As a new content team, measurement is something we’re defining. As we don’t gate our content, our primary metric is reach. We focus on top-of-the-funnel readership, quantifying these numbers using Google Analytics. We also measure sentiment on individual pieces using our Incoming Feedback widget. We always start with our ideal buyer and try to think about the problems they’re having. Most of the time, these problems might be addressed with our product. Sometimes the problem can’t be solved with our product and that’s fine too. As long as our customers are worried about a problem, we are too. We brainstorm as a content team at the beginning of each month. What are the major pieces we want to write, and who will write them? Then we have an “outlines” session where the writers pitch their articles, including the title, sections and headers, and the keyword targeted. This process identifies any problems, gaps in knowledge, or unclear sections. Done well, the writing process is simple from here. We keep it simple – posting on social media and sending an e-newsletter once a week to promote our blog posts. We also use Inbound.org and GrowthHackers, plus a few targeted LinkedIn communities. We keep an eye on traffic to our posts, but that isn’t the most important metric. The top priority is leads generated, usually through an e-book download, webinar registration, or blog subscriber. We can track from the first page visited so the dollar value of a new customer is clear. The supply of content is rising, but the demand for content is finite. But these experts have pushed their boundaries and created a system to make their content a valued resource. When the right content finds the right audience, no amount of noise can cloud the signal. Keep your audience at the center of your content marketing process. Learn more about how to do that at Intelligent Content Conference March 20-22 in Las Vegas. Register today. Use code BLOG100 to save $100 off registration. Why Is Creating Unique Content So Important For SEO?